As a rapidly growing, emerging economy, Malaysia is equipped with a good transport infrastructure system which features modern international and domestic airports, a network of well-maintained highways and an extensive intercity bus system. 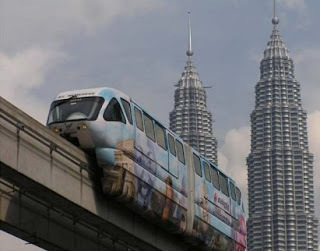 Travel within Malaysia is quite cheap and efficient and depending on your budget you can choose to travel around Malaysia by air, train, bus or ferry. Most major towns and cities in Malaysia are equipped with their own airports. The country presently has seven international airports and over fifty domestic airports. The state of the art Kuala Lumpur International Airport is one of the main access points used by travelers visiting Malaysia. Malaysia Airlines is the country’s legacy air carrier. The airline which has its main hub at Kuala Lumpur International Airport provides air links to cities like Johor Bahru, Kota Bahru, Kuala Terengganu, Kuching, Langkawi, Penang, Kuantan and others. Malaysia Airlines is a part of the One World alliance and thus offers air connections to a wide array of destinations around the world. Air Asia is a Malaysia’s most popular low cost carrier which offers air connections to several cities around the country at incredibly cheap prices. Berjaya Air is another small air carrier that operates in Malaysia out of Subang’s Sultan Abdul Aziz Shah Airport. Berjaya offers a range of domestic and charter flights to destinations like Pangkor Island, Pulau Redanh, Pulau Tioman, Langkawi and others. Firefly is yet another low cost carrier that operates within Malaysia and offers connections to several peninsular and Eastern Malaysian destinations. Malaysia’s main train network, the Keretapi Tanah Melayu Berhad (KTM), provides train services throughout peninsular Malaysia. The trains belonging to this network provide rail connections between the northern and southern regions of Malaysia. Major stops on this rail network include Butterworth (Penang), Kuala Lumpur and Johor Bahru. The KL Sentral station in Kuala Lumpur is a major hub for this service which also links KL with neighboring Singapore. Malaysia is equipped with an excellent network of well-maintained highways. The North South Expressway (NSE) runs along the entire length of Peninsular Malaysia as it extends from Bukit Kayu Hitam(Kedah) near the Malaysian-Thai Border to Johor Bahru in the southern half of the country. The eastern half of Malaysia is similarly served by the East Coast Expressway (ECE) which is known as Lebuhraya Pantai Timur (LPT) in Malay. The Pan Borneo Highway facilitates transport links between Sarawak, Sabah and Brunei. These major Malaysian highways are equipped with rest areas, toilets, food courts and emergency telecommunication units at various intervals.Aside from these major expressways, the country also has numerous feeder roads that link smaller towns and villages. Numerous bus companies operate within Malaysia and offer relatively inexpensive, interstate transport links. All major towns and cities in Malaysia are served by these buses and coaches, though the newest and best coaches are general reserved for intercity bus services around Kuala Lumpur. Taxis in Malaysia operate on intercity as well as interstate routes. Interstate taxis are known as outstation taxis and unlike intercity taxis which operate on a metered fare, the rates for interstate taxis are usually decided via negotiation and bargaining with the driver. Rates depend on the distance you want to travel though cars that are used as outstation taxis tend to be older sedans. Visitors who are above the age of 18 and are in possession of an international driving license have the option of renting a car in Malaysia. Car rental desks are available at international airports in cities like Kuala Lumpur and Penang. The speed limit on the major highways in Malaysia is 110kmph (68 mph) and Malaysia, like India is right hand drive. Remote corners of Malaysia are served by a network of ferries and express boats. In the state of Sarawak on Borneo various boats and ferries ply on the Rejang River and provide transport links between relatively isolated areas. On Peninsular Malaysia, ferries also link Penang Island to the mainland while destinations like Pangkor Island and Tioman Island are also served by a system of boats and ferries. Thank you for providing these useful ways to get around in Malaysia. For more information on the cities of Kuala Lumpur, Kota Kinabalu and Penang, please visit our site for more travel information.